The most famous of these paperweights is perhaps the L'Eglise Baccarat of 1853. This paperweight was originally set in the foundation of the Baccarat Church. The church was bombed during the Second World War, yet, miraculously, the paperweight remained intact. The canes are intricately flower-patterned and are packed at the base of the piece. Has anyone ever seen a photograph of this actual 1853 L'Eglise Baccarat paperweight? Is it in a museum collection now, or did they put it back into the cornerstone of the church? I have often read references to it, but I have never been able to find a photograph of the actual paperweight. If anyone has a lead on photograph of it, I would appreciate it. I would have to ask around to confirm but I suspect it's the one that graces the cover of the October, 1954, Vol. 1 No. 2 Paperweight Collectors Association Bulletin. Wow, Eric! That is amazing that you could so quickly identify a 1954 bulletin that included the L'Eglise Baccarat! Did the article say what happened to the paperweight? Is it in a museum or did it go back into the cornerstone? Yes this is the cover. The article, written by M. de Poncins, who was General Manager of Baccarat at the time, only retells the story of the paperweight being placed placed (along with other objects) in the cornerstone of the church and the destruction of the church. It does not say what happened to the weight. Please note that I have placed your quoted text in the initial post into a visual quote box. I have also added a reference and link to the site that I believe you used for the copy of the text. That way, we can always be sure that the Board is covered in the event of a claim of breach of copyright, even for a small section of quoted text. It is always preferable to give at least a reference to works from which text etc. is directly quoted. Thanks so much, Eric, for this great information on the 1853 L'Eglise Baccarat that was found in the cornerstone of the bombed church. And thank you, KevinH, for noticing my slip on not crediting the source for my quote. I think that it is a wonderful story how Baccarat was inspired by the antique paperweight found in the cornerstone of the church to begin making their artful canes again. It is great to see a photo of it on the front of the 1954 bulletin ... it must have been fresh news at that time! Thank you all for this good information! 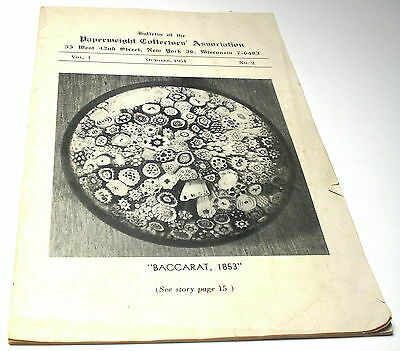 It is a good story of how Baccarat was inspired by the L'Eglise paperweight found in the cornerstone of the bombed church to resume their artful paperweights. This photo illustrates how they recaptured the craft. The first "reproduction memorial" of the "Church P/W" was done by Baccarat in 1967 here is photo of one from our collection, 3.33" diameter, 2.47" height, weight 28.44 oz. They later on, in 1973 followed it up with a second batch of memorial weights. The Baccarat logo is etched into the base along with a 1967 date cane in the close pack. The canes include all the signs of the zodiac – they did this so they would not be confused with their antique counterparts. Page created in 0.596 seconds with 28 queries.